My trusty HostGator was right on it and had me back online, but it was a bit of a mess. Hours spent pulling widgets back in, upgrades, changing passwords. It was a bad day for sure. I’ve been drooling over the latest Mobile Responsive Minimum Theme StudioPresss rolled out last week. – thanks Brian! So, at about 10pm last night I decide to just do it. 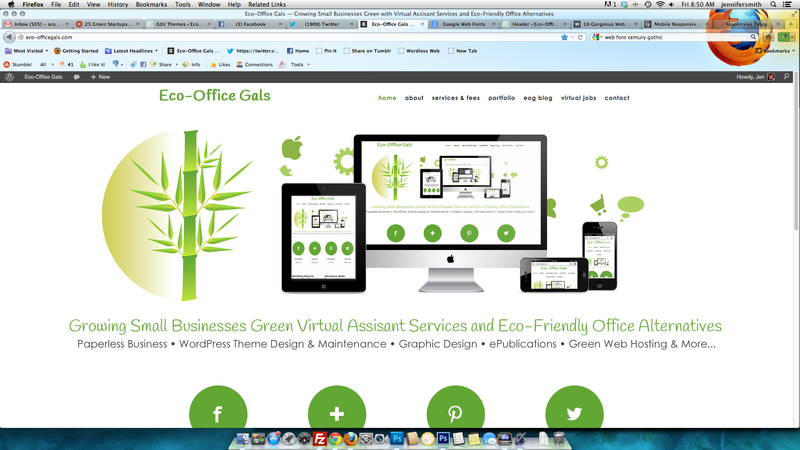 I present to you a fresh new look for Eco-Office Gals! Take a look around, look on your mobile devices too – cause that’s what a mobile responsive design is all about! There will be an all new portfolio page soon and there’s some tweaking still to be done, but if I start that this morning, my clients may hurt me! Hey, I pulled this off in about 4 hours – did I do decent?